How does the U.S. Navy prepare for monster waves? With an Edinburgh Designs wave machine! This entry was posted on November 14, 2014 by Ian. 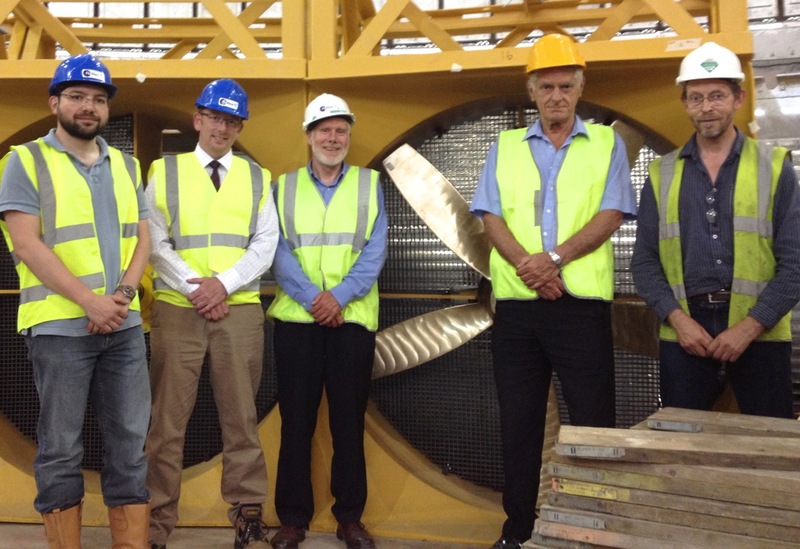 Edinburgh Designs to supply wavemakers for The University of Maine’s Wind/Wave tank. Edinburgh designs have been awarded the contract to supply sixteen 1.8m hinge depth flap paddle wave makers to the University of Maine Advanced Structures and Composites Center (ASCC) new W2 – Wind/Wave – tank.
. Read more on The University of Maine’s webpage. Edinburgh University’s spectacular new circular wave and current tank, designed and built by Edinburgh Designs, has been officially opened. 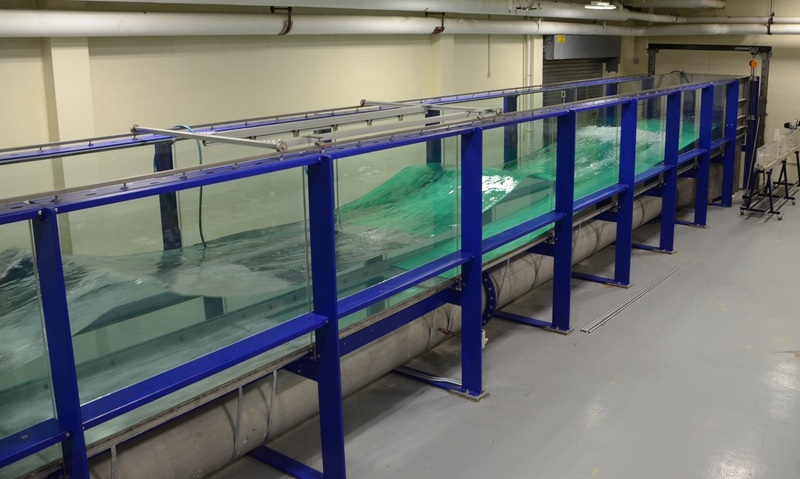 This tank can create 360 degree waves and current, independently of each other, and has been designed to simulate wave conditions anywhere in European seas. Waves are created using 168 paddles arranged around the tank, and strong tidal flow conditions can be simulated using 28 propellers located under the floor. The centre of the floor can be raised to the surface to assist in setting up devices. Read more and see a video of the tank in operation on the BBC news website. This entry was posted on June 9, 2014 by Ian. Construction is underway on the new Beaufort Laboratory which will house University College Cork’s new National Ocean Test Facility. Edinburgh Designs is supplying 16 2.5m flap wavemakers for a deep water flume, along with a hydraulically driven movable floor, for the main deep water basin. A coastal flume will be fitted with 8 0.7m flap wakemakers, also supplied by Edinburgh Designs. The third basin, the Ocean Wave Basin, will have wave generation provided by the relocated 40 x 0.7m flap wavemaker originally built by Edinburgh Designs for UCC in 1993 . See artist’s impressions of the new building here. This entry was posted on May 14, 2014 by Ian. FloWave tank now making waves. The FloWave tank at the University of Edinburgh is now complete and making waves. The video below shows a large focus event from all directions, something uniquely possible in a circular tank. This entry was posted on January 21, 2014 by Ian. The US Navy’s new upgrade to the Manouvering and Seakeeping (MASK) basin was officially opened in a ribbon cutting ceremony on 19th December by Dr. John Holdren, assistant to the president for Science and Technology. The upgrade to the 360-foot long and 240 foot-wide (110x73m) facility consists of 216 flap paddles designed by Edinburgh Designs Ltd, and can reproduce a wide variety of scale model sea conditions with continuous regular waves up to 1 metre in height possible. This entry was posted on January 13, 2014 by Ian. From left: Dr Thomas Davey, operations manager; Stuart Brown, FloWaveTT CEO; Robert Uri, client representative; Professor Stephen Salter; Matthew Rea, Edinburgh Designs Ltd director. This entry was posted on July 12, 2013 by Ian. Construction underway on US Navy MASK Basin upgrade. Construction has begun on the upgrade to wave generating equipment at the US Navy’s Manouvering And Sea Keeping (MASK) basin. The basin, part of the Navy’s Carderock Division, is one of the largest mavouvering basins in the world and, once complete in late 2013, will have 216 flap wave generators capable of producing a total of over one megawatt of wave energy. This entry was posted on April 16, 2013 by Ian.